Summer at the Sun Valley Resort seems to offer just about everything—swimming, fishing, tennis, golf, biking, trapshooting and horseback rides. The anchor of summer has always been the big sheet of ice near the lodge where skaters circle the rink and enjoy the chill on hot summer days. Lead boat in the armada of summer figure skating has always been the Sun Valley Ice Show. This year's series of 10 Saturday ice shows from July through September takes another home-run swing at the theme of Sun Valley's 75th anniversary with swift-moving and star-studded shows that mix the new with nostalgia. "I think we have a fantastic lineup of headliners," said ice show producer and Sun Valley Director of Recreation Lana Breazeale. "We're going to try to play off the occasion of Sun Valley's 75th season by bringing some nostalgia into our novelty acts and adding video projection for something new." Scott Irvine, the hard-working ice show director and ice rink manager from Bountiful, Utah, said, "We'll add a whole new production level to the show that will open up creative venues. We'll combine a little bit of the old with some of the new—and pick out numbers that have been memorable to Sun Valley audiences." Irvine and sound/lights expert Jay Cutler were working hard this week on the light sessions that will create the looks and moods of the 2011 ice show. A new video projection screen placed out on the ice in front of the skate house will add a new dimension to each ice show. The resort started to pick up the pace of its ice shows last December with its 75th anniversary "Silver and Gold Ice Show" Dec. 21 that featured Olympic gold medalist Evan Lysacek. Three days later the traditional Christmas Eve "Nutcracker on Ice" show preceded the Torchlight Parade. "We set the bar pretty high for ourselves with last winter's Christmas shows and we want to make sure we can clear it this summer," said Irvine, who spent many years performing physical skating stunts with Feld Entertainment's "Disney on Ice," starting in 1996. An ensemble star like Olympic bronze medalist Jozef "Jumpin' Joe" Sabovcik will perform one of his familiar Sun Valley classics, skated to the music of Bruce Springsteen's "Mary's Place," while he'll also do one of his newer routines. Craig Heath will reprise "Benny and Joon," and pairs skater Natalia Zaitseva will skate "I Wanna Be a Rock Star." The show's video screen will show vintage footage of the routines to accompany the newer numbers, Irvine said. "We're viewing this as a celebration of the ice shows and of all the great skating we've had up here," said Irvine. This year's 10-show schedule starting July 2 and ending Sept. 3 has been further streamlined to fill the primary summer tourist season. Just four years ago, Sun Valley did 15 shows each summer, starting June 16 and running through Sept. 15. This year it's every Saturday night from Independence Day to the Wagon Days holiday. In contrast to past years when big-name foreign skaters topped the ice show bills, this year's headliners are most of the prominent U.S. stars, mostly in singles. One reason is the axis of the world's top skaters has swung from Europe and the U.S. over to the Far East. The current women's single world champion and top-ranked female is Miki Ando, 23, of Japan. Akiko Suzuki of Japan is third, and South Korea's reigning Olympic champion Kim Yu-Na, 20, is ranked second. For the men, three of the top four in the International Skating Union (ISU) world rankings come from Japan—Daisuke Takahashi, Nobunari Oda and Takahiko Kozuka. "We would have liked to have the Japanese girls here, but unfortunately their time is monopolized," said Breazeale, who also cited the high cost of bringing in a top skater from overseas. "We're fortunate to have the stars we have. We always seem to get a better crowd for American skaters because people recognize their names." The biggest name is American Evan Lysacek, who will headline back-to-back in the July 16 and 23 shows. At Vancouver in 2010, Lysacek became the first American to win the Olympic title in men's singles since Brian Boitano in 1988, and the first reigning world champion to prevail in the Olympics in 26 years (Scott Hamilton in 1984). Returning to Sun Valley Aug. 13 are reigning Olympic ice dancing silver medalists and 2011 world gold medalists Meryl Davis, 24, and Charlie White, 23, from Michigan. They are ranked No. 1 in the world by the ISU, and are the three-time defending U.S. champions. And Sun Valley kicks off its season with one of the most promising U.S. women, 18-year-old Mirai Nagasu of California. Ranked No. 11 in the world, Nagasu became the first American woman in 70 years to win the U.S. junior and senior titles in successive years when she captured the national title in 2008. Known as a great spinner, Nagasu placed fourth in the 2010 Olympics, at age 16. "Mirai is young, but she has trained and performed here before, and we're glad to have her back," said Breazeale. Like last year, 2006 Olympic silver medalist Sasha Cohen is twice a headliner, the first time at the Aug. 6 show and in the Labor Day finale Sept. 3. A delightful addition to the ice show has been 12-year-old Nathan Chen from Utah, who is entering the seventh grade. The youngest of five children, Chen is the two-time U.S. Novice Men's champion. He performed at four ice shows last year. Irvine said, "Nathan is a dynamite little skater. We love having him here." Chen will perform with Nagasu at the July 2 ice show and also join three other shows—July 30, Aug. 20 and Sept. 3 this year. Each Sun Valley Ice Show lasts about 70 minutes. Headliners make their entrances for a few numbers, but the show's full-time summer ensemble does most of the entertaining. Core skaters include Craig Heath, Ashley Clark, Darlin Baker, Sabovcik and the Russian pairs team of Elena Leonova and Andrei Khvalko, 1999 and 2000 world professional champs. Returning with his wonderful comedic touch is Michigan's Dan Hollander, 39, 1996-97 U.S. bronze medalist. Olympic bronze medalist and two-time European champion (1985-86) Sabovcik, 47, is from the Czech Republic. He was third in the 1984 Olympics behind Scott Hamilton and Brian Orser. Known for his long-flowing blond hair and skating to rock music, Sabovcik has performed in the ice show longer than anyone. Clark, from Denver, has 12 years of experience as a professional skater all over the world and is a two-time USFSA gold medalist in Freestyle and Moves in the Field. Like Baker, she teaches at Sun Valley. Baker is a longtime Sun Valley Ice Show regular who has performed with The Ice Theater of New York. Known for his crowd-pleasing spins and engaging personality, Heath, 43, was the last U.S. senior championship skater to win compulsory figures, in 1991. He teaches spins, jumps and tricks at Sun Valley in the summer. The summer cast for a second year includes Kimberly Navarro, 30, and Brent Bommentre, 27, the 2008-09 U.S. ice dancing bronze medalists. They are joined for a first year by pairs skaters Natalia Zaitseva and Bert Cording. Offering what Breazeale calls "the wow factor" is Irina Grigorian, whose expertise includes juggling and whirling hula hoops as the audience watches with wonder. She toured many years with the Ice Capades and has created an act that is truly circus art on ice. "Most people don't expect hula hoops when they come to an ice show. But Irina is beautiful, slender and talented, and she brings something that we're looking for in our novelty acts—something that's different," said Breazeale. July 2—Mirai Nagasu and Nathan Chen, with fireworks. July 9—Alissa Czisny, 24, the Bowling Green State University grad and winner of U.S. national titles in 2009 and 2011. Known for fast spins and graceful spirals, Czisny placed fifth in the 2011 world championships and is currently ranked No. 7 in the world by the ISU. 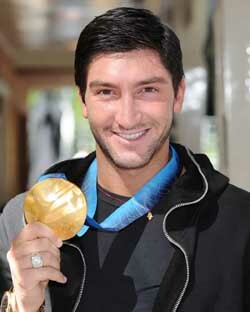 July 16 and 23—Evan Lysacek, 26, Olympic gold medalist and 2007-08 U.S. king who is currently ranked No. 18. July 30—Johnny Weir, 27, the 2008 world bronze medalist and three-time U.S. men's king (2004-06) from Pennsylvania. Aug. 6 and Sept. 3—Sasha Cohen, 26, the 2006 Olympic silver medalist from Westwood, Ca. who won the 2006 world bronze medal. A two-time Olympian for the U.S., Cohen was a two-time world silver medalist in 2004-05 and a two-time Skate Canada gold medalist. She wrote her autobiography, "Fire on Ice," in 2005 and has toured with Stars On Ice. Aug. 13—Meryl Davis and Charlie White are currently the longest-running ice dance partnership in the U.S. at 14 years and counting—and they're coming off one of their best competitive years capped by a world title at Moscow. Aug. 20—This year's U.S. men's champion Ryan Bradley, 27, from Missouri, is known for his crowd-pleasing backflips and triple axels. The 5-11 star who skates his short programs to rock and roll music pulled off a quadruple jump in the short program at Greensboro, N.C. this year to win his first national title in 11 attempts. Bradley then retired from competitive skating May 10. Aug. 27—Very popular at Sun Valley are five-time U.S. ice dancing champs Tanith Belbin and Ben Agosto, 2006 Olympic silver medalists. Ontario native Belbin, 26, and her Chicago-born partner Agosto, 29, won the world bronze medal in 2007. They retired from competitive skating in June 2010. Sun Valley Resort will once again offer a traditional dinner buffet with the ice show. It costs $102 per person for the buffet and show. All tickets will be priced $5 higher for the July 2, 16 and 23 performances, only. For the show only, this year's bleacher reserved seat prices range from $34 to $60 per person. Cost for the Sun Room Terrace (show only) is $64. Non-refundable tickets are now on sale at the Sun Valley Recreation Office, 622-2135. Tickets may be purchased online at seats.sunvalley.com. All seating is reserved and advance reservations are recommended. You can also buy tickets at the gate before the shows.